The referendum on British membership in the European Union revealed how polarised the country is politically. The UK voted to leave the European Union on Thursday by a final vote of 51.9% to 48.1%, and a map showing how each region voted makes it clear that the country is divided. Scotland, Northern Ireland, London, and other major cities in England had “Remain” majorities, while “Leave” won the majority of votes in Wales and smaller cities in England. 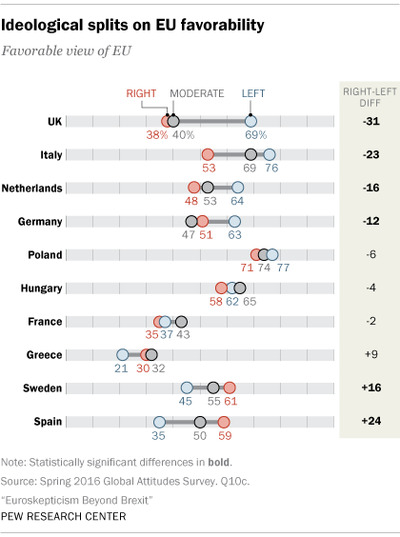 And a survey from Pew Research Center shows that the UK is even more polarised than other European countries. The UK is more politically divided than any other country with regard to the EU. While a small minority of right-leaning Brits view the EU favourably, the vast majority of left-leaning Brits see the bloc in a positive light. And there’s a pretty big gulf between moderates and left-leaning Brits. 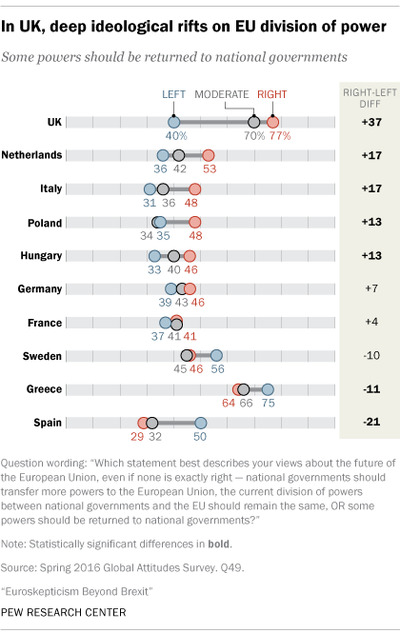 The country is also divided on the question of EU powers. While a minority on the left say powers should be returned to national governments, the overwhelming majority on the right want to see national governments take back power. Moderates also agree with the latter view. Dina Spector contributed to this report.